Some children do better when their environment is quiet and calm. Call us to schedule your Childs appointment during a quiet time. Our stylists are very patient and work well working with children’s needs! We recommend that you specify your child’s needs or related concerns when you schedule your appointment. If booking online, you can include this information in the comments box. If new spaces and new people are challenging for your child, we recommend that you bring them in just to check out the salon and meet the stylists! You can do this anytime that we are open. If you have any special items that comfort your child please bring them! You can also bring a special treat or reward for your child. AmberSky offers suckers and a toy basket, with the permission of the family. Be sure to talk with your child about the hair cut before! You can use our tips and suggestions below to help guide your child. Schedule a time to come in so that your child can be acquainted with the environment. Speak with the stylist or scheduler at the time of your booking to let them know of any articular sensitivities that your child may have. Identify any reinforcers or preferred items that your child likes. This could be a book, toy, food item, etc. 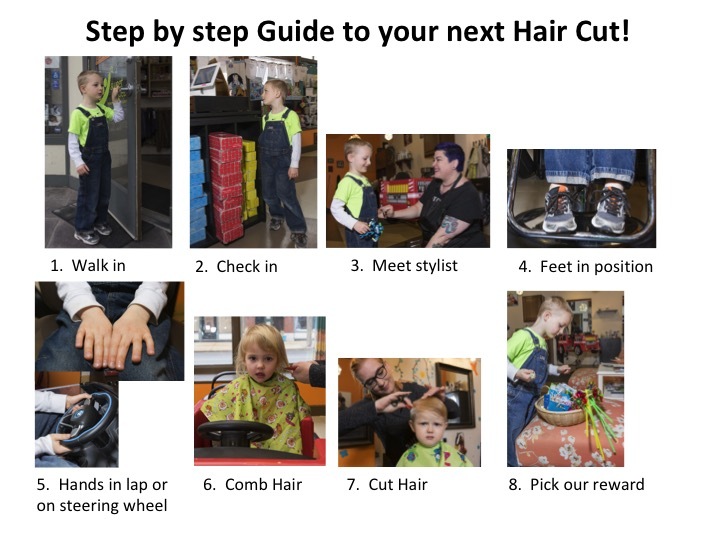 Go over the step by step visual guide with your child so that they know exactly what to expect. Practice getting a pretend hair cut at home! Go though each step with your child. In addition, be sure to print off the step-by-step photo to share with your child. Some children find that being prepared by viewing those step-by-step photos helps to let them know exactly what to expect!